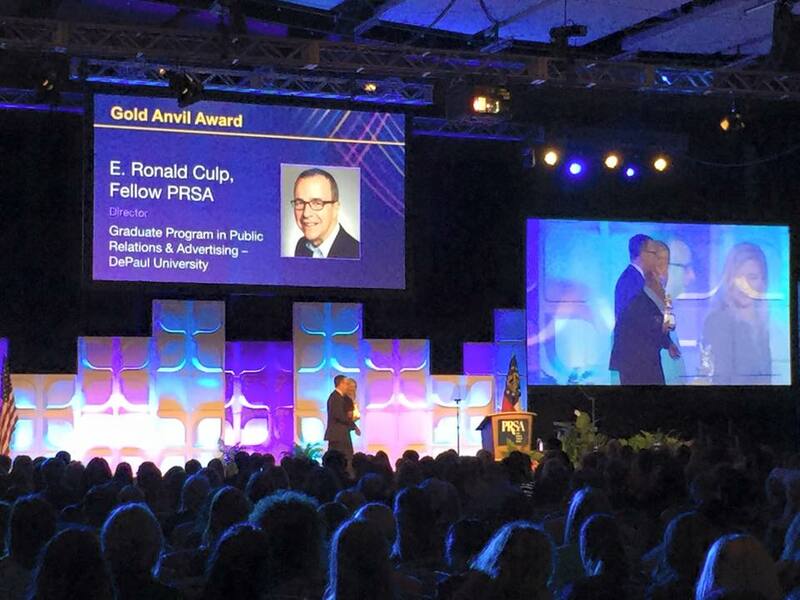 On November 8, 2015, the Public Relations Society of America (PRSA) awarded Ron Culp, Fellow PRSA and board member of The Plank Center, with the Gold Anvil Award for Lifetime Achievement in Public Relations. The Gold Anvil is the Society’s highest Individual Award. It is presented to a PRSA member and public relations practitioner whose accomplishments have made a major contribution to the profession. Throughout his rich professional career, he has been a true servant leader. Ron’s developed hundreds of great men and women in our profession during his corporate, agency and academia leadership roles. He exemplifies the ethical, transparent and devoted practitioner. He’s never too busy to mentor a professional colleague, counsel a young leader or to respond to the development needs of a student. I am humbled and proud to receive this incredible award. I first heard about the Gold Anvil shortly after joining PRSA when I began my first job in Corporate America at Eli Lilly & Company in Indianapolis—site of next year’s conference. Never in my wildest dreams did I think it was even remotely possible to be standing here with this beautiful award in this setting with many, many friends. There are lots of others in this room and many more in this profession who are very deserving of this award, but none could be more proud than I am at this very moment. I owe this recognition to both loving what I do and being lucky enough to have worked with many great teams and mentors throughout my life. One of those mentors has been along for the ride for the past 47+ years since we met in a sophomore year journalism class. Hence, my first bit of advice today: Find yourself a great editor, a trusted confidant and a best friend. I did. Say hello to my wife, Sandra Culp. Sandra and I love history—she loves the real stuff, mostly all things England. I prefer the history of this great profession of ours. Now, I didn’t know Howard Chase, but I wish I did. 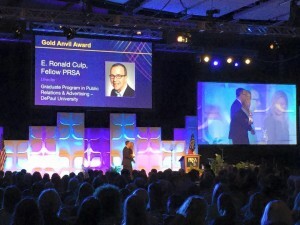 He received the very first Gold Anvil shortly after he helped found PRSA in the year I was born. A reporter turned agency guy before joining corporate America and eventually landing in academe. Sounds familiar! Howard coined the term “issues management.” Like all of us, Howard Chase had many mentors, including Ivy Lee, one of the forefathers of public relations. How cool is that? Besides my due diligence on Howard Chase, I was compelled to study the entire list of prior recipients and was surprised that I actually knew 37 of them, remarkably almost half. And many played significant and/or cameo roles at various times during my career–names such as John Paluszek, Al Golin, Harold Burson, Tom Hoog, Fred Cook, Judy Phair, Cheryl Procter-Rogers and Ray Kotcher. Let the record show that I thank each and every one of them for their ongoing support and friendship over the years. Sadly, two other friends and mentors who received Gold Anvils are no longer with us, but I cannot discuss my career without mentioning the valuable influence they have had on me. I’ll begin with the late, great Dan Edelman who “adopted” me when I moved to Chicago some 30 years ago. Dan and Ruth Edelman opened their world to my wife and me, and helped drive home the importance of family, hard work and paying it forward. I learned much from Dan, although I could never fully appreciate he and Ruth’s passion for Wagner operas, which they graciously invited us to often. Another important person I met shortly after arriving in Chicago was the 4′ 10″ bundle of energy named Betsy Plank. I was a bit intimidated by this little powerhouse of a woman. After all, I was a fairly new kid on the block and she already had amassed multiple firsts during her career – first woman in senior management at Edelman, the first woman to head a division of Illinois Bell, and first woman president of both the Publicity Club of Chicago and PRSA. She also was the driving force that created PRSSA. That unto itself was a legacy of significant note. As Betsy was prone to do, she quickly detected that I was a fellow “believer” in paying it forward. I quickly became a member of her extended family – just like many of you who knew her. Later, when I already was overcommitted with extra-curricular activities, I knew I had to find time to help Betsy with her goal to start the Plank Center for Leadership in Public Relations. Over the past 10 years, I have quietly departed most other boards in order to devote more time to helping carry out Betsy’s vision for the Plank Center—to build bridges between the profession and academia, to encourage and celebrate mentorship, and to conduct research that helps support a stronger public relations profession. I also share Betsy’s commitment to the future of our profession, the future that looks increasingly brighter thanks to the dynamic young people I’ve been meeting over the past two days at PRSSA. Betsy and Dan and other great PR leaders understood that mentorship comes in all shapes, titles, sizes and colors. The best mentoring relationships happen organically. They are not forced. That’s why most formal mentorship programs are long on good intentions, but short on results. If you love what you’re doing, those relationships will find you. And take it from me, it’s magic when it happens. I have experienced that magic and I hope to continue doing so. I hope you are all doing the same in your careers. We must all pay it forward to continue to advance this great and important career choice of ours. I’m, indeed, proud of this great profession—a profession that I thank each and every day for allowing a small-time boy from Remington, Indiana, to exceed his wildest career expectations.